Hosta plants are herbaceous perennials that come in many different types. The most natural way to group the varieties is by leaf color. The foliage can be blue, gold (yellow), or green. Or, sometimes, one will find a pleasing blend, as when there is just enough yellow and green to form chartreuse. In addition to all of this variety in color, these stars of the foliage world are often variegated. The leaves of hosta plants also come in a number of sizes and shapes. Shapes can be elongated (sword-shaped, for instance) or something more rounded (such as those with heart-shaped leaves). In some cases, leaves are flat; in others, concave. Leaf surfaces may be smooth or bubbled (the technical term for this bubbly look is "seersuckered"). Finally, hosta flowers come in a great variety of colors and sizes. Hostas are usually treated as shade plants since the colors of their foliage tend to fade if exposed to too much sun. The gold-leafed types of hosta plants are an exception: They will not attain their optimal golden color without receiving quite a bit of sun. 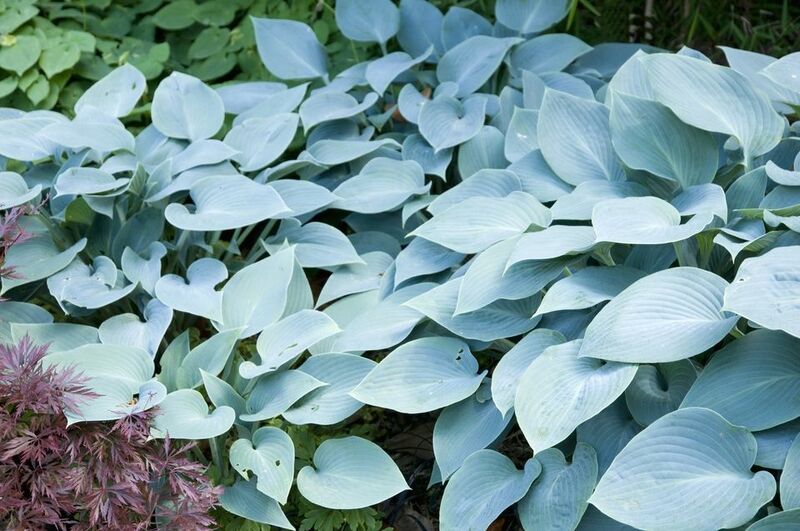 By contrast, most green-leaved and blue-leaved hosta plants will lose their rich color if they receive too much sun. However, since fragrant hostas need some sunlight for full flower development, you may wish to make an exception for them, else you will miss out on their wonderful aroma. Hosta plants are more often grown for their foliage than for their flowers. Many varieties should be grown in partial to full shade. An exception may be made for Hosta 'Plantaginea,' which will bear white flowers that are highly fragrant if the plant is given sufficient sunlight. In fact, one of the common names for these hosta plants is "fragrant" hosta plants, and their flowers are larger than those of most other types. Hosta 'Plantaginea' blooms in late summer. Fragrant hosta plants can be grown in USDA plant hardiness zones 3 through 9. At maturity, fragrant hosta plants will stand 1 to 1.5 feet tall with a spread of 1.5 to 2 feet. Grow them in a sunny area. Variegation in hosta plants is manifested in a couple of different ways. Foliage is termed "medio variegated" when the lighter color (white, light green, or yellow) occurs in the center of the leaf. For example, Hosta 'Undulata Variegata' (zones 3-8) is white in the middle and green at the edges. These hosta plants reach 1 to 2 feet in height, and about the same width. They produce a lavender bloom in early summer. By contrast, when the lighter color occurs on the edge of their foliage, hosta plants are said to be "marginally variegated." One example is 'Francee.' Another is the related H. 'Patriot,' grown in zones 3-8. Its leaves are green in the center and white on the edges. These hosta plants reach 1 to 1.5 feet in height, with a spread of 2 to 2.5 feet. Their lavender blooms appear later than those of H. 'Undulata Variegata'. The very popular 'Frances Williams' is another example of a marginally variegated hosta. Generally speaking, variegated types can take a bit more sun than green- or blue-leafed hostas, although too much sun can fade their bright colors. Hostas are commonly planted in rows as edging plants to form borders in a landscape design. They are reasonably low-maintenance, not least of all because their dense foliage crowds out much would-be weed growth around them, making hostas an effective ground cover (you will still have to supplement with mulch, however). But do not mistake "low-maintenance" for "no-maintenance." You should implement the following tips to ensure that you are caring for your hostas properly. Hostas need a lot of water. They grow best with good drainage but will stand for some clay. Fertilize your hostas. The American Hosta Society states, "The norm seems to be an application of around 10-10-10, three to four times per year." The "10-10-10" referred to is the NPK number. After blooming, cut off the scape (the stalk that bears the bloom). Otherwise, nourishment is wasted, traveling to the seed pods instead of going to the crowns). As the foliage of hostas begins to die back in fall, remove it to prevent decay in the planting bed, which is an open invitation to slug pests. Divide the plants when spring comes, if you'd like to propagate. Are You Patriotic About Your Hosta?